Our work with a leading discount retailer helped them boost energy savings, facility efficiency and more. Read the full article here. As is the case throughout most of our industry, discount-oriented retailers are adapting to rapidly evolving and dynamic consumer preferences. To become more competitive, some operators are introducing fresh food options and produce. But adding food to the retail mix also potentially creates a new set of challenges for retailers related to food quality, safety and preservation. With a national network of store sizes ranging from 6,000 to 16,000 square feet, the operator’s next step was to put a plan in place that addressed new refrigeration requirements and ways to optimize operations across their enterprise. This approach would call not only for a more proactive approach to help ensure food freshness, quality and safety, but also automate the management of HVAC, refrigeration and lighting systems for maximum reliability and energy efficiency. Emerson, in conjunction with partner OEMs, proposed a plan that introduced a combination of reliable compression technologies, advanced facility controls and remote monitoring capabilities through ProAct™ software, Alarm Management and Resolution services. This is just a glimpse into what Emerson products and solutions can do for your operations. As the industry incorporates more fresh food offerings, we’ll continue to develop ways in which our customers can optimize their facilities and ensure food quality and safety. For more information, read the full article here. Emerson Climate Technologies recently released a white paper titled “Condition Based Maintenance: Putting Predictive Maintenance Algorithms to Work to Optimize Asset Maintenance and Performance in Supermarket Refrigeration Systems.” In this paper, I introduce the concept of condition based maintenance (CBM), highlighting the benefits of this service for retailers, illustrating the savings in maintenance costs and energy consumption that can occur with the adoption of CBM. CBM is basically what it says: performing maintenance based on the condition of the equipment being monitored, rather than on a preventative maintenance (PM) schedule or after a failure. 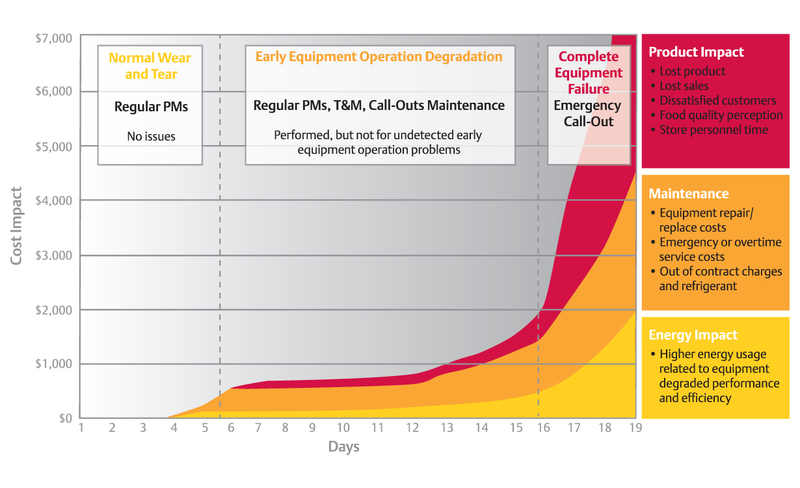 Using CBM, retailers can expect to see typical equipment maintenance savings of 18-40 percent, compared to PM or run-to-failure strategies. The regular reporting function, combined with technical expertise to interpret it, provides actionable intelligence with significant ROI. By utilizing run-time data analysis to optimize asset maintenance and equipment performance, CBM provides supermarket maintenance managers with a sustainable maintenance solution that offers visibility into the condition of their refrigeration systems. CBM also uses algorithms for refrigerant slow leak detection, enabling early detection and potential resolution, which can save refrigerant, equipment, product and overtime labor. Emerson offers condition based maintenance as part of its ProAct™ Services portfolio, offering new value to retailers in the areas of maintenance and energy management, and in compliance for refrigerant management and food quality. You can read the full white paper on condition based maintenance here. For more information on condition based maintenance, you can also read previous Climate Conversations blog posts, including an introduction to CBM and an overview of my 2013 Technology in Action Conference (TAC) presentation. What maintenance strategies do you use? Does condition based maintenance offer a solution to your maintenance concerns?